Trinity was delighted to help launch a new, national campaign this week (28 February 2018) to highlight effective treatment options available for women living with stress urinary incontinence (SUI). Following months of alarming media coverage about the effects of TVT-tape or “mesh” on some women who had been treated for SUI, a recent national poll of 2,000 women uncovered that almost half (48%) felt that these recent concerns about mesh would deter them from seeking any advice from a health professional about treatment options. Experts are now calling for women to see past the recent headlines and, rather than suffering in silence, encouraging them to speak to a healthcare professional about their problem as a priority. Effective alternatives to mesh are available and women need to discuss the best available treatment options for them. 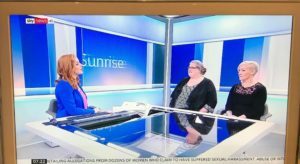 As part of this empowering campaign, Trinity worked alongside medical innovation company, Contura International, a leading Consultant Urogynaecologist and an inspiring patient case study and hosted a series of broadcast interviews, including live features on Sky’s “Sunrise” and Channel 5 early evening news, with an overall audience reach of around 4million. Stress Urinary Incontinence is a common condition, affecting an estimated 30% of women worldwide. Two thirds of these women suffering from SUI are undiagnosed. The condition can have a significant impact on daily life affecting activities, relationships and emotional well-being. It can occur at any stage of life, with risk factors including pelvic disorders from childbirth, obesity and ageing. Yet, despite its prevalence, the survey also showed that women still found discussing SUI taboo, with well over a third of women (39%) saying they had waited up to 6 months before eventually seeking treatment and a staggering 12% leaving it for up to 5 years or more. Four in 10 (39%) of women admitted they avoid certain activities (such as bouncing on a trampoline with their children, wearing certain clothes or attending an exercise class), for fear of accidental bladder leakage, rising to 52% of women aged 35-44. Overall, around 9 out of 10 women questioned agreed that women living with SUI are likely to simply “put up with” the condition, rather than seeking treatment and advice, despite any negative effects on their quality of life, relationships or ability to exercise. Dr Helen Johnson said “As a healthcare professional, committed to helping women regain their confidence and quality of life following a diagnosis of stress urinary incontinence, it worries me that so many women are apparently avoiding expert help and the opportunity to explore a successful treatment plan. Bulking agents (which are generally lesser known than surgical approaches to treating SUI) are a minimally invasive (meaning no cutting of the patient’s tissue or skin), safe and effective treatment for stress urinary incontinence which have been used for over 10 years. The current market leader Bulkamid® (essentially a water-based gel that helps the bladder neck to close when needed to help prevent bladder leaks) has an 80% success rate when used as a first line treatment and to date has successfully treated over 50,000 women.